Hello again! Well, I am in my new house, which is very exciting… but more importantly, the kitchen is just about done! It was one of my priorities, and I couldn’t get wait to get back in there. My new kitchen has much more room than my old one, and I am already off and using it. In these hot summer days, I wanted to be in the kitchen but not create a lot of heat. So, I made a Tomato, Dill, and Goat Cheese Panini. Delicious, and the closest thing to a grilled cheese I have had in a while! Spread the goat cheese on one slice of bread. Sprinkle the dill on top of the goat cheese. Layer the tomato and put the other piece of bread on top. Butter both outside sides of the bread, and cook on a panini grill or stovetop until done. 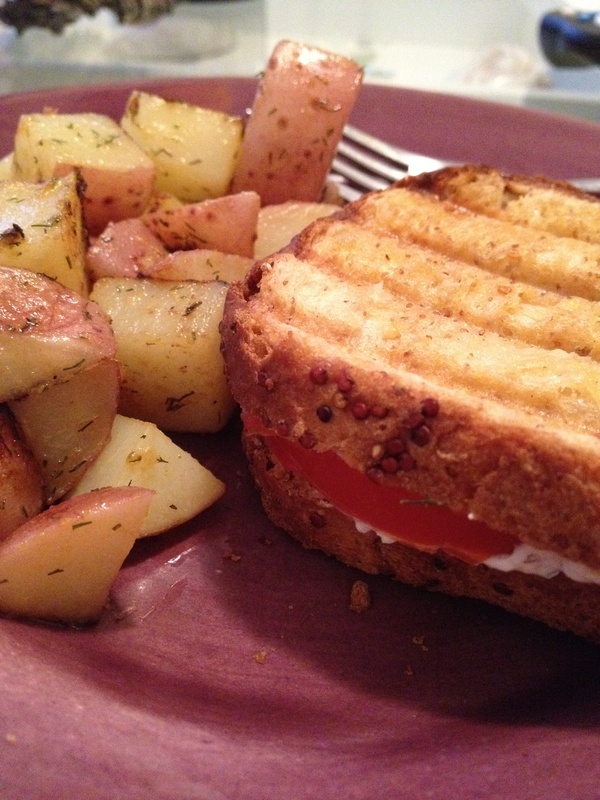 I paired it with red bliss potatoes sauteed with some dill and hot honey mustard. Great combo!